Bendysh Hall Bed & Breakfast01799 599220work FarmhouseIt is situated 5 miles from Saffron Walden, 25 minutes from Cambridge and 1 hour from London. In this pretty corner of north Essex on the borders of Cambridgeshire, Suffolk and Hertfordshire. A perfect location for a relaxing break, visiting local attractions, walking and cycling. 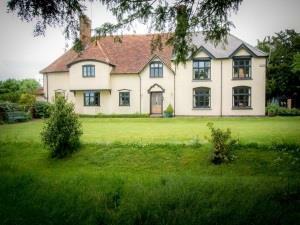 The house is surrounded by 300 acres of arable land incorporating old meadows and woodland. The farmhouse has been renovated to a high standard with many of its original period features restored. The house offers quiet, comfortable rooms, wonderful views and hearty breakfasts using homemade produce with locally sourced ingredients. Ideal for walkers and cyclists as a pack lunch can be ordered. We have cycle racks, washing facilities for bikes and drying facilities for wet clothing and footwear. There are maps of the area and information on local attractions such as Duxford Imperial War Museum, Newmarket Races, Cambridge colleges and beautiful villages of Thaxted, Finchingfield, Clare, Long Melford and Lavenham all in easy reach. It is situated 5 miles from Saffron Walden, 25 minutes from Cambridge and 1 hour from London. In this pretty corner of north Essex on the borders of Cambridgeshire, Suffolk and Hertfordshire. A perfect location for a relaxing break, visiting local attractions, walking and cycling.